Oyster information can be found online at the website Squidoo. Unfamiliar with Squidoo? Squidoo is a website in which users create "lenses" on topics of interest. Lenses are pages, kind of like flyers or signposts or overview articles, that gather everything someone knows about a topic of interest--and snaps it all into focus. So what oyster information can be found on Squidoo? 1. Go Shuck An Oyster - Connecting people with oysters, shucking knifes, festivals, t-shirts, etc. 2. Delicious Oyster Recipes - Recipes. 3. True Facts about Oysters - True facts. 4. Oyster - Information and facts. 5. Seafood Festivals - A listing of seafood festivals. 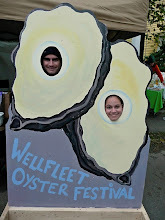 Click on some of the links above to view a Squidoo about oysters. Considering creating your own lense about a topic that interests you? Click here to get started and learn more.